Small Garden with Big Ideas! Have a small garden but want an area that appears spacious? The tips below give pointers on how you can create the illusion of space in your small garden! If your garden is a tad on the small side, admit to yourself you may not have room for all of the items you desire to have. This may mean saying goodbye to the idea of the huge pond or the set of table and chairs you’ve always wanted. By being realistic you’ll be able to determine what will really fit in and what will cause clutter and make the garden appear smaller than it already is! Planting warm coloured plants (red, oranges and yellows) near to your house whilst planting cooler coloured plants (blues, purples and greens) at the end of your garden will trick the brain into thinking it is actually longer – creating the illusion of distance! Adding height to your garden is another way to create the illusion of space. Planting trees and using climbers are a great way to draw the eye upward which ultimately makes up for the garden space you lack on the ground! Take care when picking trees and plants however. You need shrubs that will grow upwards and not outwards, for example the ‘Leyland Cypress’ tree. Garden trellis along a fence or a wall is another option that will again create height and the illusion of space. Paths are great for functional purposes, but did you know they can also help make your small garden appear bigger? By creating a curvy path that bends around corners will give the illusion of an ‘ever going’ path, making your garden seem like it goes on longer than it actually does! Leave Space – Clutter is not an option! Homeowners with small gardens have less choice when it comes to choosing the right furniture to use in their gardens. In these cases, less is most certainly more. By keeping your garden clutter free you’ll create the illusion of space. Choose furniture that can be easily hidden away- which may mean saying no to a garden table and chairs and replacing it with a garden bench that can be moved about with ease. Small gardens are less hard work? Definitely not! Before planning your new garden make sure you factor in that small gardens need just as much attention, thought and care as large gardens do! 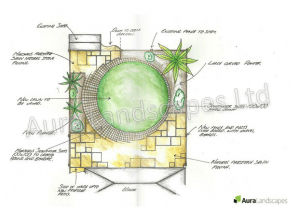 If you need help creating the perfect space, speak to us about our garden design service.